Warmed up after an ice-driving event near Winter Park a few days earlier, two spirited sport-model autos were sent my way – the 2017 Alfa Romeo Giulia Ti all-wheel-drive sedan and the 2018 Dodge Challenger GT all-wheel-drive coupe. Shod with Bridgestone Blizzaks, the Challenger probably owns a second or two of grip advantage over the Giulia, with its Pirelli winter set; regarding handling qualities, though, the Alfa perhaps will exceed the Dodge’s capabilities. The Challenger competes aggressively with the Ford Mustang and Chevy Camaro, just as the three did way back in 1970, when they were among the best of the pony cars. The GT designation means the Challenger is equipped with all-wheel drive, V-6 engine, an active transfer case and front-axle disconnect. It’s a 305-horsepower, 3.6-liter V-6 with 268 lb.-ft. of torque and an 8-speed automatic transmission. AWD is not available with the more powerful Challengers. What the GT does for the Dodge is lend it an edge in consideration of winter driving. 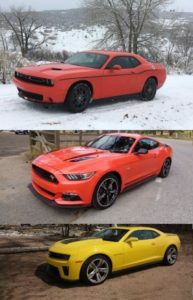 All three – the Camaro, Mustang and Challenger – are rear-wheel-drive-based two-doors. 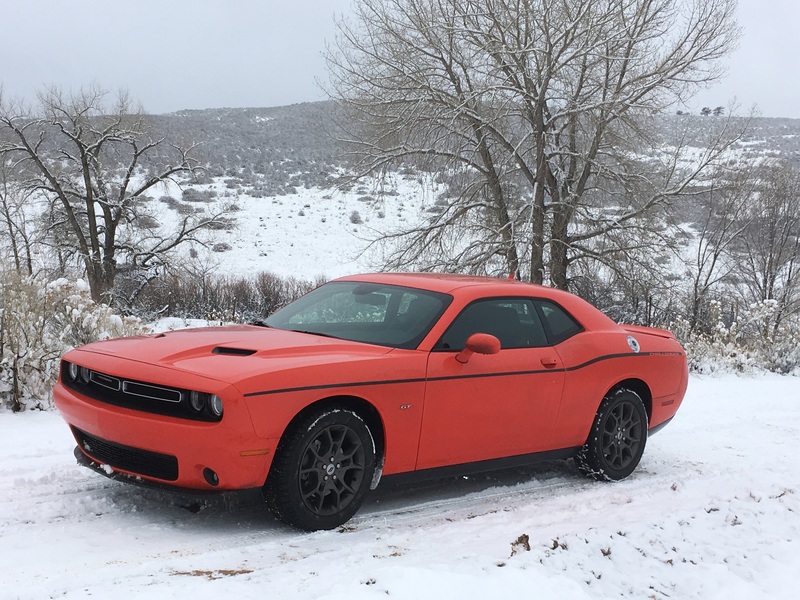 So, for Challenger to add the AWD option, even in V-6 form, is a boost in winter-laden states such as Colorado. Neither Mustang or Camaro offer it. The Ford Mustang outsold the other two in 2017, with 81,866, and the Camaro edged the Challenger, 67,940 to64,537. All three perform powerfully with V-8 blocks beneath the hoods. Last summer, I spent a week with the 2017 Challenger SRT Hellcat, which performs with 707 horsepower from a supercharged, 6.2-liter Hemi. It is a blast to drive, with performance-tuned suspension noticeable at high speeds. 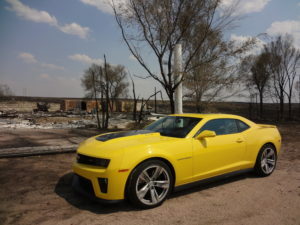 The most powerful Camaro I’ve driven was the 2012 ZL1 with 580 horsepower from a supercharged 6.2-liter V-8 and 6-speed manual transmission. 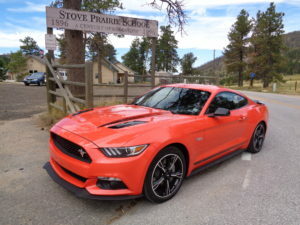 A year earlier, I had enjoyed the 2011 Ford Mustang Shelby GT500, for which supercharging its 5.4-litier aluminum V-8 produced 550 horsepower and 510 lb.-ft. of torque. The ’18 Challenger GT is finished in go mango tangerine orange, with body side stripes, rear spoiler, granite crystal painted wheels, nappa leather and alcantra suede seats, Harman Kardon premium sound and 18 speakers. Sticker price is $37,670. The Alfa Romeo Giulia luxury sport sedan carries a sticker or $49,340. Performance is from a 280-hp, 2-liter turbocharged 4-cylinder engine and 8-speed automatic transmission. I reviewed a similar model seven months ago in a drive to Walden and Laramie, Wyo. The Alfa, which competes with Audi, BMW, Volvo and others, is built in Italy and well-suited to driving in Colorado’s imperfect terrain. Alfa Romeo Automobiles is a subsidiary of Fiat Chrysler Automobiles.